This Wedge Keto Taco Salad is one of those weeknight dinners that I make all the time. 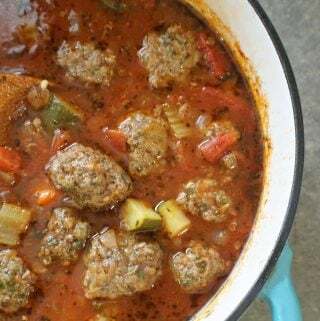 It is quick, easy, and most of all – delicious! I personally love wedge salads. They are made by removing the core and cutting a head of iceberg lettuce into 4 wedges, but if you’re not a fan of iceberg lettuce feel free to use any lettuce you prefer! This taco salad only takes as long to prepare as it does for the ground beef to cook. While the ground beef is cooking, all you do is cut your lettuce into 4 wedges, whip up some ranch dressing, and gather your toppings. It’s that easy! I usually serve mine simply with the seasoned ground beef, tomatoes, salsa, and avocado or my Best Ever Guacamole. But you can also add sour cream (or dairy free sour cream), cheese (if you tolerate dairy), or any other toppings your heart desires. And as for the ranch dressing – please, I’m begging you – don’t use the bottled stuff! I promise you, this ranch dressing is way better than anything you will every buy at the store. It’s super easy to whip up, rich, creamy, and is perfectly ranch-y (if that’s a word!!!) with no funny aftertaste. 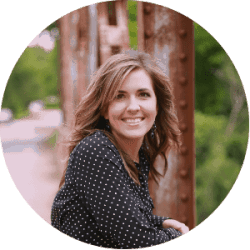 Plus, it is Whole30, Paleo, Keto, and can be made egg-free! Here’s my Ranch Recipe. Prefer tortillas? I have lots to choose from! 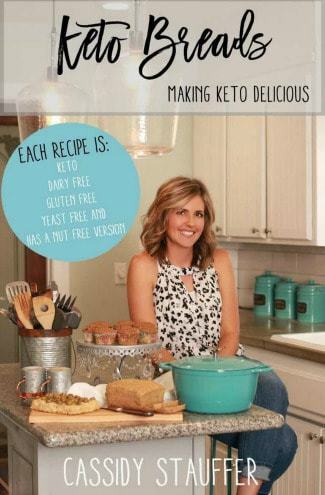 Check out my Paleo Tortillas, Cassava Flour Tortillas, Paleo, Egg, & Nut Free Tortillas, or my Keto Tortillas in my new Keto Breads Cookbook!! This Wedge Keto Taco Salad is one of those weeknight dinners that I make all the time. 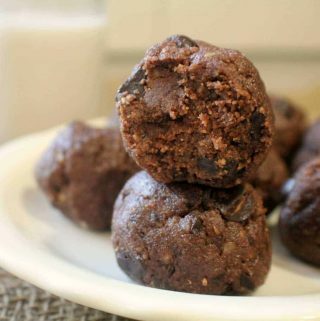 It is quick, easy, and most of all - delicious! Add avocado oil to large pan and heat over medium high heat. Add beef and onion then cook until meat is browned and onions are translucent. Add remaining ingredients. Taste as adjust seasonings as needed. Bring to boil. Then, reduce heat and simmer for 15-20 minutes. Prepare the taco meat and ranch dressing. Cut the head of lettuce in half, then half each half so you have 4 beautiful wedges! Place each wedge on a separate plate. 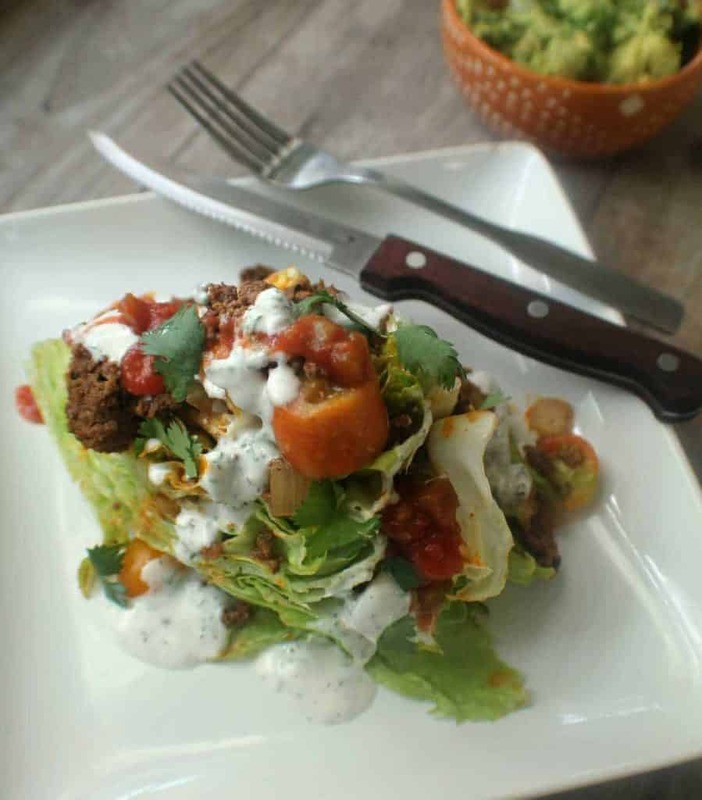 Add taco meat, tomatoes, avocado, and any toppings you preder to each wedge. You may need to slightly slice into the wedges to keep the toppings from falling off. Drizzle on the ranch dressing and serve. Sprinkle with additional salt if desired. Nutritional information does not include ranch dressing. I’ve been looking for some new salad ideas and this one is perfect. We always love homemade taco seasoning in my house. 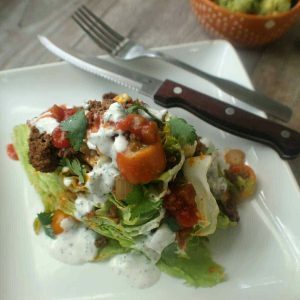 This is a great twist to a wedge salad. I think I will make up a batch of the seasoning mix to have on hand for my Mexican recipes. This will be on my next taco night menu! Thanks Leslie! Yeah, I use that taco seasoning recipe all the time – it’s my go-to!! !